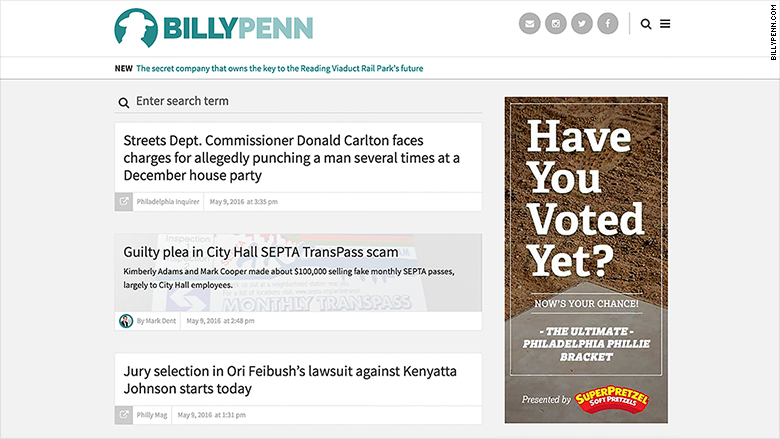 BillyPenn.com is taking its formula to Pittsburgh thanks to a Gannett investment. The founders of Billy Penn, a local news startup in Philadelphia, are launching a second site in Pennsylvania's second biggest city, Pittsburgh. With the help of a recent investment by Gannett, Billy Penn's owner Spirited Media will launch the as-yet-unnamed site by the end of the summer. The business model will mimic Billy Penn's, revolving around events that sponsors support and attendees sometimes pay to attend. Longtime digital media executive Jim Brady, Spirited Media's founder and CEO, said events accounted for 84% of Billy Penn's revenue last year. While the Philly site is not yet profitable, "We're growing revenue every month and adding more events," he said, eying profitability in 2017. "What I like about the events model so much is that we make money on things that deepen peoples' connection to the site," rather than interrupting their experience with ads, he said. Other digital news startups are trying similar approaches, like the Charlotte Agenda in North Carolina and the Texas Tribune. Billy Penn, which launched in late 2014, has been well-received in Philly. Earlier this year the Columbia Journalism Review said "the site has showed that it is capable of moving the needle on big stories" and "can point to growth on a number of fronts." In March Gannett — the largest newspaper publisher in the country by circulation — bought a minority stake in Spirited Media. The investment amount was not disclosed. Gannett and Brady said the investment would allow Spirited to expand to "new local markets," plural, triggering a guessing game about where. Capital New York reported last month that the second city candidates were Chicago, Pittsburgh and Baltimore. Afterward, "a lot of people from Pittsburgh popped up saying they were interested in working for it," Brady said. The hiring plans are already underway. Chris Krewson, the top editor of Billy Penn, said he visited Pittsburgh a few weeks ago. And "several Billy Penners will be in on the interview/candidate selection process," Krewson said. Pittsburgh is a relatively rare two-newspaper city, with both the Post-Gazette and the Tribune-Review. Brady said he views the Billy Penn model as more of a "digital alt weekly" than a traditional daily paper. Pittsburgh is appealing for numerous reasons, he said: It's a "big university city," "there's a big booming tech scene" to cover, and a "fast-growing 35-and-under demographic." As for Baltimore, he said it may well be Spirited Media's third city.